Over the last few decades, the distance average consumer goods travel from manufacturer to retailer has multiplied tenfold. Items that were once produced just miles away from where they were sold are now traveling halfway around the world to reach store shelves. The extra distance traveled means that more diesel-powered vehicles are required to transport these goods from point A to point B. Shipping and transportation employers throughout Nebraska are expanding their shipping fleets to meet this increase in demand. These businesses are also in great need of certified diesel mechanics to help repair and maintain the diesel-powered vehicles. Individuals hoping to enter this industry as diesel mechanics should strongly consider earning their certification prior to applying for available positions. Community colleges and vocational institutes that offer certification programs in diesel technology have certain educational prerequisites that future students must meet prior to enrolling. While each school is different, all post-secondary colleges require students to have first earned their GED or high school diploma before they can be accepted into the program. Some state universities and colleges require students to have taken certain courses in high school, with the most common requirement being four years of English as well as two years of math and science. Before companies call in applicants for interviews, employers initially screen out individuals who have not earned a certificate or degree in diesel technology. Although some companies will work with applicants who have several years of diesel mechanic experience, most will want applicants to have earned a degree. As the need for certified diesel mechanics grows, some companies around the United States and in Nebraska have begun sponsoring diesel technology programs for applicants. While this number is growing, individuals who wish to enter the diesel mechanic industry as soon as possible should pursue their diesel technology degree at a vocational or technical institute. Regardless of what schools may claim, all diesel technology programs are not created equally. Being the gold standard among employers for college accreditation, the National Automotive Technicians Education Foundation (NATEF) prepares students for further certification after graduation. Before enrolling, individuals should verify that the diesel mechanic program is accredited by the NATEF. Depending on what the school offers, students can earn an associate or bachelor’s degree in diesel technology. Students who decide to pursue their associate’s degree in diesel technology can expect to take two to three years to complete the program. During this time, students will gain the hands-on experience they need to secure an entry-level diesel mechanic position in Nebraska, with some of the skills covering the repair and diagnosis of common diesel engine problems. An associate’s degree in diesel technology also consists of some core classes, such as biology and Algebra, to prepare students for education continuance after graduation. Students who want to own or manage their own diesel garage or transportation company will often pursue a bachelor’s degree in diesel technology. Taking up to five years to complete, this degree gives students a much deeper understanding of the technology behind diesel engines. Students receive some hands-on experience in a lab environment, but the majority of this program is spent in a classroom setting. Certified instructors teach students about the internal workings of diesel engines, and students have the option to take business management courses to prepare for management opportunities down the road. 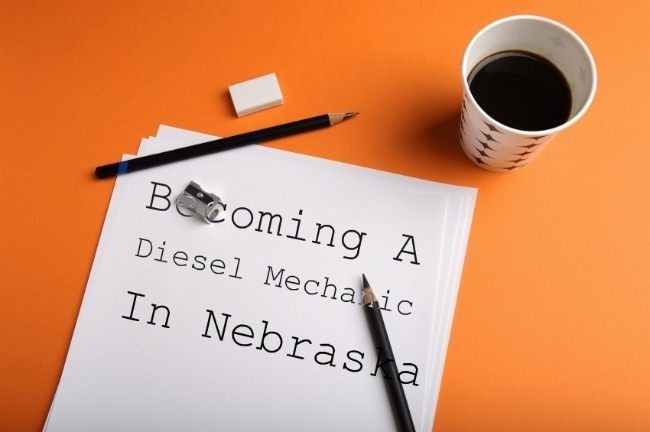 Although companies prefer to hire candidates who have earned a degree in diesel technology, Nebraska does not require mechanics to obtain their license to work legally in the state. As recent graduates begin to secure positions as diesel mechanics, opportunities arise for mechanics to earn additional certifications after having obtained several years of experience. The National Institute for Automotive Service Excellence (ASE) offers certification opportunities for diesel mechanics to show a proficiency in preventative maintenance, brakes, electrical systems, and steering systems. According to a recent report issued by the U.S. Bureau of Labor Statistics (BLS), approximately 2,150 diesel mechanics work at companies throughout Nebraska, with the average salary being $36,490 a year. As the diesel industry continues to grow faster than normal, companies throughout the United States are expected to add 21,600 more diesel mechanic positions by 2022. Urban Transit Systems: As more Millennials turn to public transportation over personal vehicles, large cities will need to expand and grow these systems to keep up with the demand. Diesel mechanics can find employment opportunities servicing the growing public transportation fleets. Local Garages: Diesel garages in large cities and small towns will need to hire more certified diesel mechanics as businesses grow and expand. Transportation Companies: Retailers and manufacturers are placing higher demands on transportation departments every year. Diesel mechanics will be needed to maintain and repair the growing number of diesel vehicles in the shipping fleets. As the demand for diesel-powered vehicles increases, the need for Nebraska companies to hire additional certified diesel mechanics to maintain and repair the shipping fleets also grows. Individuals who earn their certificate or degree in diesel technology will find that opportunities abound in the diesel industry. Aspiring diesel mechanics who wish to begin the certification process should strongly consider enrolling in a diesel technology program as soon as possible, providing them with job stability and various advancement opportunities in this career.